Brooks Koepka reacts after putting on the 14th green during the third round of the U.S. Open on Saturday. SOUTHAMPTON, N.Y. – Brooks Koepka doesn't lack in confidence, a quality that could be a big advantage Sunday in his bid to become the first back-to-back Open champion since Curtis Strange did the trick in 1988 and 1989. 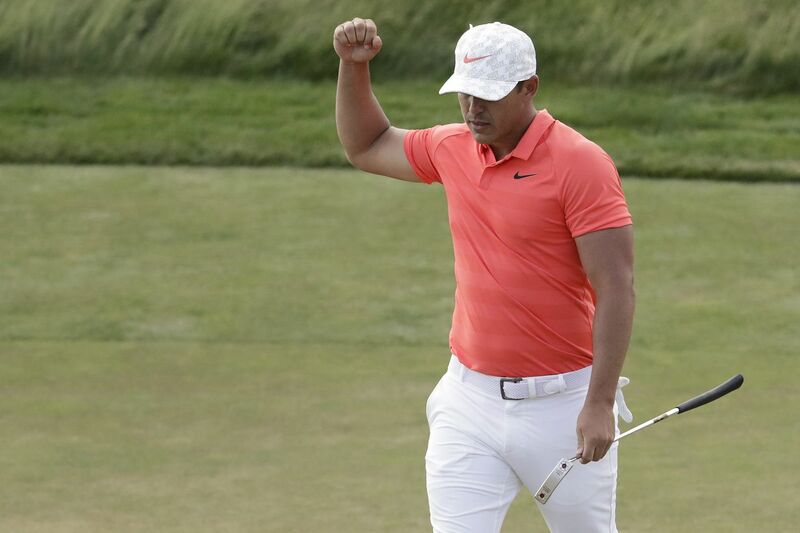 Koepka battled the elements and a Shinnecock Hills Golf Club course that changed noticeably Saturday from the time he started until the time he finished in the Long Island evening, and held a share of the lead at 3-over-par 213 following a 72. "I feel really good about the position I'm in," said Koepka, 28, who won last year at Erin Hills by four strokes. "I think tied, it's a nice feeling. I won this thing last year. I feel really good. My game's in a good spot." But he said the one thing he'll try to do is not think about his chance to make history. "I've got almost 24 hours before that even comes into the equation," he said. "I'm just thinking one shot at a time, just keep plugging away, doing what I'm doing. I feel confident. It's that you've just got to eliminate double bogeys. If you can do that, you'll be just fine." The early leader board watchers noticed what nice rounds of 4-under 66 that Daniel Berger and Tony Finau fashioned after teeing off in the day's seventh and 11th groups, respectively. What they didn't know at the time was that their 54-hole scores of 3-over would be enough to get them into Sunday's final pairing. Of course, they didn't know it at the time they met reporters. "I think it's going to be extremely difficult this afternoon," said Berger, 25. "I'm only going to imagine that as the wind picks up and the sun beats down on (the greens), they're just going to get firmer and faster." Finau, 28, who is 12th in the FedExCup points race, was asked how far behind the leaders he needed to be to make a run on Sunday. "I think more than six (strokes) is going to be too far back," he said, "but I do think you can make five or six shots up on this golf course." Jim Furyk, the 2003 U.S. Open champion who received a special exemption into this year's championship, showed that he still has game in a major at age 48, firing a 72 that got him to within three strokes of the lead. "It's definitely one of the most solid rounds I've played this year," said the West Chester-born Furyk, who is playing in his 24th Open. "I've just done a really good job this week of not letting much bother me, not getting upset with myself and just accepting the mistakes because you're going to make them here." Furyk is the second-oldest player, behind Steve Stricker (51), to make the cut.